We are honored that you are interested in joining our team, TEAM MVH. The members of Team MVH are exceptional men and women who share a common commitment to service to our communities, excellence in clinical care and customer service that is second to none. Prior to viewing positions for which we are accepting applications or volunteer opportunities, please review Monongahela Valley Hospital’s STARS, our Standards of Performance. 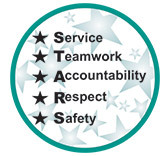 Our STARS, Service, Teamwork, Accountability, Respect and Safety, reflect our team’s expectations for each other. Answers any unattended telephone within three rings. Responds to our guests in need of assistance by answering a call light or bed alarm. Smiles and greets fellow elevator passengers, and if needed, patients and visitors come first, even if it means you exit the elevator. Check with guests who are waiting to provide for their comfort. Follows through and follows up. Delivers on what was promised. Treating each other with respect and valuing each person’s unique contribution to our Hospital. Understanding that being rude to others is never acceptable. Arriving at work on time and as scheduled. Helping each other and never saying it’s not my job. Is responsible for the outcomes of his or her work. Participates in problem solving by exchanging positive thoughts, opinions and information. Seeks ways to improve the care of our guests. Is willing to accept new roles, responsibilities and challenges. Treat guests and co-workers as unique individuals. We value diversity. Maintain and protect guest and co-worker confidentiality at all times. Use personal protective equipment as appropriate. Report all accidents and incidents promptly. To view positions for which we currently are accepting applications, please click on the continue button below. By clicking on the continue button, you acknowledge that, in the event you are employed by Monongahela Valley Hospital, you will abide and adhere to the above standards of performance at all times. You also acknowledge that failure to comply with these standards of performance will result in termination of employment. Are you looking for a way to give back to the community? Monongahela Valley Hospital is continually recruiting volunteers for the Auxiliary of Mon-Vale Health Resources, Inc. the Ask Me! Greeter Program and for the Orthopedic Institute . The Auxiliary of Mon-Vale Health Resources, Inc. If you want to make a difference in the lives of your neighbors, there’s a place for you in the Auxiliary of Mon-Vale Health Resources, Inc.
For more information about the Auxiliary, please call the hospital’s Community Relations Department at 724-258-1234 . Anyone who is compassionate makes a good volunteer. At Monongahela Valley Hospital, volunteers serve as extensions to practically every department. Some people welcome visitors as Ask Me Greeters in the main lobby while other volunteers help assemble patient education folders. People who volunteer can work flexible hours – as few as two hours per week, once a month, etc. MVH recognizes that everyone has special talents and the concierge who manages the Ask Me! Greeter program matches each person’s talent or strength with where they can make the greatest difference in the hospital. The Orthopedic Institute at Monongahela Valley Hospital is changing the way that patients and their families experience joint replacement. This proven program is centered around the fundamental principle of wellness and volunteers play an active role in the patient experience. Volunteers work beside the medical and professional staff as they provide care to patients. They support patients – serving-one-on-one – sometimes even as an extended family ‘coach’ during therapy and group activities when needed. The Orthopedic Institute volunteers also assist with the pre-op classes, group therapy sessions, group and reunion lunches, preparing and cleaning equipment for physical therapy, preparing patient information packets and visiting with and encouraging patients.